Ocean and Chance The Rapper each brought a parent along with them. 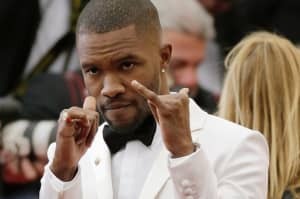 Frank Ocean and Chance the Rapper are among a very select group of guests invited to tonight's White House State Dinner, the last of Barack Obama's presidency. The two were photographed arriving at The White House tonight, each with a parent as their plus one. Before arriving, Chance took to Twitter and Instagram throw up a picture of he and his dad, Ken Bennett arriving at the event. Soon after, Frank was photographed arriving with his mother, Katonya Breaux. Ken Bennett has had a long career in Chicago politics, including time as an aide to former mayor Harold Washington, during which he worked with a young Senator Obama. Frank and Chance were also joined at the dinner by an illustrious group of dinner guests, including Jerry Seinfeld, Gwen Stefani, James Taylor, Mario Batali, actor Roberto Benigni, New York Governor Andrew Cuomo, and Italian Prime Minister Matteo Renzi. Some fun details from their introductions: Chance mentioned that he and the President have had a "recurring dance battle" going for the last few years, and Frank kept it very based by showing up in a pair of slip-on checkered Vans.